Instagram is beta testing a chronological timeline feature, according to some users. 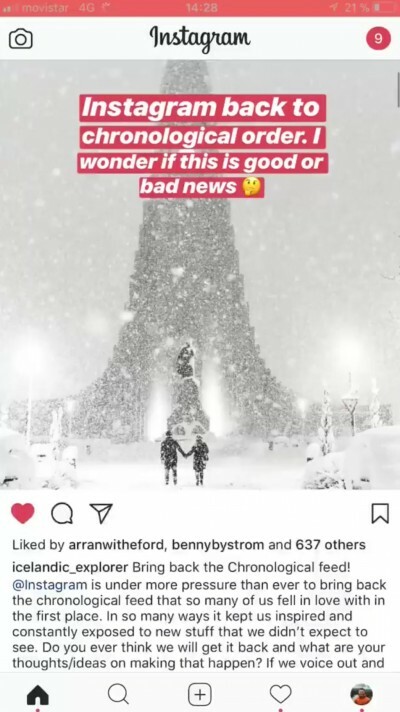 One of the users, Gunnar Freyr (@icelandic_explorer) posted a video in his Instagram story of scrolling through his now chronological timeline. A few other users have also reported noticing this although most people currently, including myself, do not have it yet. One of the changes that were made to post Facebook acquisition Instagram was a Facebook-like non-chronological timeline. This was powered by an algorithm that automatically brought up images from people you communicate with most or recently followed accounts and pushed other content further down the timeline. The logic here was that regardless of what time of the day you open the app, the accounts you care about most will always be on top. Most users, myself included, saw this as a downgrade. A chronological timeline is easy to understand, even for novice users. It gives every post a logical place on your timeline that is consistent every time you opened the app. It also gives a clear hierarchy to multiple images posted by a user one after the other especially if that order was important to those images. The current algorithm not only shuffled images from different accounts but it also shuffled the timeline of images posted from the same account for no logical reason. But by far the worst thing about this was there was no way to opt out of it. Facebook promoted this feature as being in the user's interest and it did increase user engagement but it helped brand account more than anyone else as brands no longer had to worry about their posts getting buried down somewhere for someone living in a different timezone. It was clear where Facebook's interests lie but after two solid years of complaining from users it seems Facebook has finally decided to listen. As of now it seems as if again it will not be an optional change, so those who actually liked the algorithmic timeline will likely be miffed, but a vast majority of users will finally get their demand fulfilled. If they revert instagram's layout to the way it was when it first released. Then that would make it the best social platform by far.